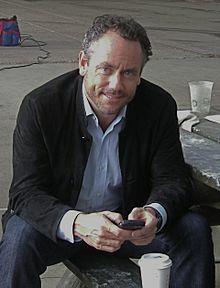 William Brett Wilson, CM SOM (born on July 1, 1957; named after his father William George) is a Canadian investment banker, businessman, investor, and philanthropist. He is a season 3 panellist on CBC Television's Dragons' Den. Wilson was born in North Battleford, Saskatchewan. He holds honorary doctoral degrees from Royal Roads University and his alma mater, the University of Saskatchewan. As of 2015, Wilson is a member of the Order of Canada's Advisory Council. Wilson graduated from the University of Saskatchewan with a Bachelor of Science in Civil Engineering and worked for Imperial Oil for three years in the oilfields of Western Canada. In 1985 he graduated from the University of Calgary with an MBA in entrepreneurship and began work as an investment banker with McLeod Young Weir Limited (now Scotia Capital). Wilson co-founded an investment banking advisory firm, Wilson Mackie & Co., in 1991, and in 1993, co-founded FirstEnergy Capital Corp with Rick Grafton, Jim Davidson and N. Murray Edwards. FirstEnergy is a Canadian stock brokerage firm that provides investment-banking services to global participants in the energy sector. With offices in Calgary and London, England, the firm is now 20% owned by the French company Societe Generale. Wilson retired as Chairman of FirstEnergy in 2008. He invests in the energy, agriculture, real estate, sports, and entertainment industries through his primary holding company, Prairie Merchant Corporation. He is Chairman of Canoe Financial, a privately owned investment management firm focused on Canadian resources. His sports interests include ownership in the Nashville Predators of the National Hockey League. After announcing his departure from Dragons' Den in early 2011, he participated in his own entrepreneurship-themed series, Risky Business. He has written regularly on entrepreneurship for the Oilweek, Alberta Venture  and the National Post. In 2012, he published Redefining Success: Still Making Mistakes through Penguin Books. He regularly speaks to student and business audiences about the importance of marketing, entrepreneurship, and philanthropy and believes these subjects should be elementary core curriculum. Wilson has claimed that he sees corporate social responsibility not as an obligation, but as an opportunity, and believing that strategic philanthropy can create major social and economic benefits. He has shaved his head to support Kids' Cancer Care, and climbed Mount Kilimanjaro to support Alzheimer's research. He has for many years made annual trips with Youth with a Mission to Mexico to build homes for the poor. He has chronicled his philanthropic perspectives in a series of articles written for Alberta Venture magazine. Wilson has focused his philanthropic initiatives on his home provinces of Alberta and Saskatchewan. He established the Wilson Centre for Entrepreneurial Excellence at the University of Saskatchewan in 2007 to promote entrepreneurship in all colleges at the university. Specific events hosted by Wilson have supported prostate cancer, David Foster Foundation Right to Play, Little Warriors, Boomer's Legacy, 777 Run for Sight and Dare to Care and the Veterans' Food Bank. He is helping out the Tomorrow Project, a large research project to discover more about the causes of cancer and related prevention techniques. He is active on funding research into the issue of domestic abuse and has funded the Wilson Centre for Domestic Abuse Studies at the Calgary Counselling Centre. He is a supporter of the Canadian Olympic Swim Team. He also supports the sport of volleyball through the Rally Pointe volleyball centre in Calgary, Alberta. He is a strong mental health advocate and supporter of programs which help with the treatment of eating disorders. He travelled to Afghanistan to visit front-line Canadian troops with General Walter Natynczyk, Defence Minister Peter MacKay, hockey player Guy Lafleur and actor Paul Gross  and has hosted events to support military members and their families. Wilson was married to his engineering classmate Pamela Janzen from 1981 to 2001. Together they have three adult children, Rebecca, Justine and Russel. ^ Hiebert, Richard W. "The incomparable Brett Wilson". North Battleford News-Optimist. Retrieved 19 November 2015. ^ "W. Brett Wilson : Canoe Financial". Canoe Financial. Retrieved 19 November 2015. ^ General, The Office of the Secretary to the Governor. "The Governor General of Canada". ^ "Former Dragon Brett Wilson starts Risky Business". The Globe and Mail, April 20, 2011. ^ "Why you shouldn't wait to give, and what the government can do to encourage you to do it - Alberta VentureAlberta Venture". albertaventure.com. ^ "The School Of Brett: Three ways to help students change the world - Alberta VentureAlberta Venture". albertaventure.com. ^ "Return on Investment: Fun Raising - Alberta VentureAlberta Venture". albertaventure.com. ^ "W. Brett Wilson". Financial Post. ^ Inc., Indigo Books & Music,. "Redefining Success: Still Making Mistakes, Book by W Brett Wilson (Paperback) - chapters.indigo.ca". www.chapters.indigo.ca. ^ "Return on Investment: The Give and Get Play - Alberta VentureAlberta Venture". albertaventure.com. ^ Wells, Jennifer (17 March 2010). "Brett Wilson: The Dragon with a heart" – via Toronto Star. ^ "U of S News Releases: Wilson Centre for Entrepreneurial Excellence Established at University of Saskatchewan". Announcements.usask.ca. April 16, 2007. Retrieved 2008-12-01. ^ "Gala Winners Named at The Special Event 2009". specialevents.com. Retrieved 2009-02-10. ^ "May 10, 2006" (PDF). Retrieved 2008-12-01. ^ "SWIMNEWS ONLINE - Swimming News, Swim Meet Results, Swimming World Rankings, Swim Links, Calendar". Swimnews.com. Retrieved 2008-12-01. ^ "Our Story". Rally Pointe. ^ With, I'm Here. "The Power of W. Brett Wilson". imherewithmagazine.com. ^ "Calgary's favourite entrepeneur [sic] - The Gauntlet". www.archive.thegauntlet.ca. ^ "Business Person of the Year 2008: Brett Wilson". Alberta Venture. Retrieved 19 November 2015. ^ "U of S: University Advancement: Alumni Relations: Alumni Awards". Usask.ca. Retrieved 2008-12-01. ^ "University of Saskatchewan - 100 Alumni of Influence". Usask.ca. Retrieved 2008-12-01. ^ "Brett Wilson Archives - Alberta VentureAlberta Venture". albertaventure.com. ^ Wilson, Brett. "Speech by W. Brett Wilson". royalroads.ca. Royal Roads University. Retrieved 26 February 2015. ^ "Government of Saskatchewan". Government of Saskatchewan. ^ SAIT. "Honorary Degree Recipients - SAIT, Calgary, Alberta". www.sait.ca. ^ "Honorary Degrees - University of Saskatchewan". library.usask.ca. ^ "Bob Edwards Award Past Recipients - Bob Edwards Award". www.bobedwardsaward.ca. ^ "2016 Inductees - Canadian Petroleum Hall of Fame". www.canadianpetroleumhalloffame.ca. ^ "Oil & Gas Council - Home". www.oilandgascouncil.com. ^ "Oil & Gas Council Gala Dinner (May 26th): Brett Wilson & Jim Davidson To Receive 2016 Lifetime Achievement Awards". This page was last edited on 4 October 2018, at 05:49 (UTC).